"A sleek countertop unit that churns out enough ice for even big parties." "Portable, efficient, and affordably priced." "This little beauty produces up to 26 pounds of bullet-shaped ice per day." "Buyers will find a worthy splurge." "Make an impressive 48 pounds of cubes per day." "This versatile machine can be free-standing or built-in." A sleek countertop unit that churns out enough ice for even the biggest parties and ice-loving families, the NewAir AI-215SS is a great all-around ice maker, its owners say. It makes an impressive 50 pounds of bullet-shaped ice in 24 hours, makes three different cube sizes and can even produce 12 pieces of ice in just 13 minutes. The NewAir comes with a removable ice bin, ice scoop, 18-hour timer, LCD display and self-cleaning function. 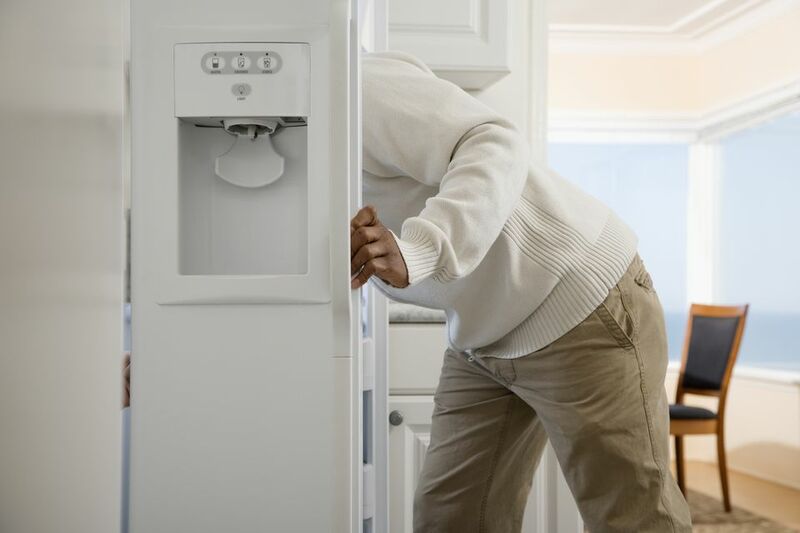 There are indicator lights to tip off users when the ice maker needs more water or the ice bin should be emptied. It has a side-mounted drain that reviewers say is easy to use. Some owners are disappointed that it doesn’t store more ice – reviewers estimate that it will hold only a few pounds at a time. But they do love how fast it works as well as the fact that no installation is required – just plug it in. At about 17 by 17 by 14 inches, it’s compact enough for most countertops, and it comes in both red and stainless steel. If you’re an ice lover on a budget, the Della Portable Ice Maker can easily produce the cubes you crave for under $100. It churns out up to 26 pounds of ice each day, and can hold up to 1.5 pounds of ice at a time. Users can select from two sizes of bullet-shaped cubes. Impatient? You can have nine pieces in as little as six minutes. The Della Portable Ice Maker includes a removable tray, an ice scoop, and easy push-button controls. Indicator lights alert users when the water level is low or the ice bucket is full. Owners love how compact and inexpensive this Della is, though a few express durability concerns, saying it stopped working within several months. At about 13 inches tall, nearly 10 inches wide and 14.5 inches deep, it’s small enough to tote around or store on a space-crunched counter. It’s available in black, red, silver and stainless steel, but any choice other than black commands a price premium. Hundreds of reviewers agree that the Igloo ICE103 is one of the best portable, compact ice makers on the market. This little beauty produces up to 26 pounds of bullet-shaped ice per day and can store 2.2 pounds at a time in its ice bucket. If you’re picky about cube size, note that this unit can make three sizes: small, medium and large. The Igloo ICE103 comes with a removable ice bucket, an ice scoop, and push-button controls. There are indicator lights that come on when the bucket is full or water needs to be added. 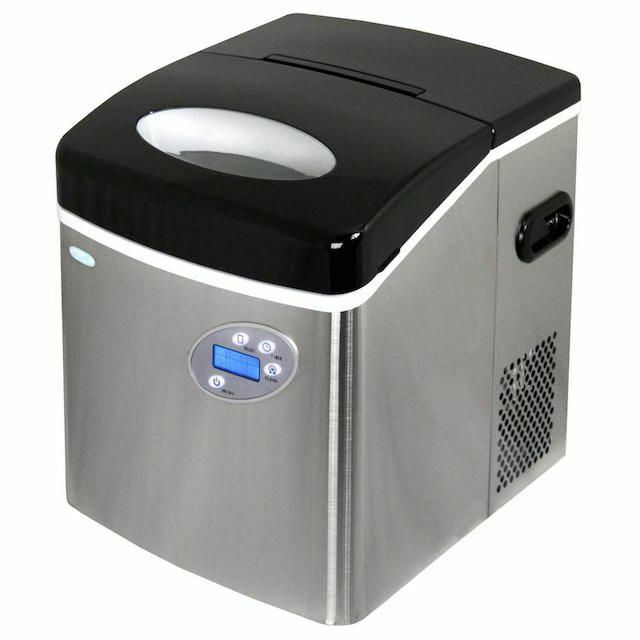 Owners love that this model stores more ice at a time than similar portable ice makers, and they say it’s relatively fast while cranking out the cubes, too. But some do complain of durability issues, saying it only worked for a few months – a common complaint for budget-friendly ice makers. The black lid and brushed stainless steel casing will fit in just about anywhere, and at 14 by 12 by 15 inches, it’s small enough for tight quarters such as RVs or boats. Buyers who have a little more money to spend on a built-in ice maker will find a worthy splurge in the Whirlpool GI15NDXZS, which can make up to 50 pounds of ice in 24 hours. Even more impressive, it can store 25 pounds of ice at a time – great for anyone who hosts large gatherings and can’t wait around for more ice to be made. However, it does only make one size of ice cubes. The Whirlpool GI15NDXZS comes with an ice scoop, self-cleaning cycle, touch-pad controls, a door alarm and a replaceable water filter for better-tasting ice. An automatic ice level detector will shut off production when the bin is full. It comes in black, white and stainless steel, so it’s sure to match up with just about any other appliances, but buyers should note that a drain is required for installation. The self-leveling legs make it easy to install even when the floor is uneven, and the door is reversible – handy for tight galley kitchens or bars. The ice maker is about 34 inches high, 15 inches wide and a bit over 25 inches deep. This Della model is a great compromise for buyers who don’t want a huge ice maker but still need more ice than many countertop and portable models will produce. It can make an impressive 48 pounds of bullet-shaped cubes per day, and users can select from three sizes. There is also a fast six-minute operating cycle for users who want ice fast. Features on this Della include a full-basket indicator, add-water indicator, automatic overflow protection, and a removable basket and scoop. There are push-button controls, and reviewers love the ease of the plug-and-play setup. Some say it isn’t the best choice if you have little space on your counters, because at 18 by 21 by 20 inches, it will require a decent amount of real estate. However, they do appreciate how much ice it produces, and how quickly it does it. The stainless steel casing and black top will be right at home in a modern kitchen or bar area. If you prefer the versatility of an ice maker that can be either free-standing or built-in and don’t need a ton of cubes every day, the Whynter UIM-155 could be a good pick. It makes 12 pounds of crescent-shaped cubes in 24 hours, and it can store up to 6 pounds of ice. It’s also a lot more budget-friendly than other models that can be built-ins. Thanks to an automatic stop feature, the Whynter won’t keep churning out ice when the removable bin is full. It features one-button controls, an included ice scoop, front venting and no-drain construction. Owners say it’s a great replacement for busted refrigerator ice makers or occasional entertaining, but many note that it just isn’t going to make enough ice for big parties. This stainless steel and black model will be a good fit in any modern bar or kitchen. It’s 25 inches high, 15 inches wide and 18 inches deep, and it will require a pro to installation if you want it built into cabinetry.